The Avengers: "A Touch of Brimstone"
"Extraordinary crimes against the people, and the state, have to be avenged by agents extraordinary. Two such people are John Steed, top professional, and his partner Emma Peel, talented amateur. Otherwise known as The Avengers." Emma Peel: "I've come here to appeal to you, Mr. Cartney." The Honourable John Cleverly Cartney: "You certainly do that." Worldwide it is quite possible that The Avengers is the most famous spy show to emerge out of the United Kingdom in the Sixties. In fact, short of Doctor Who, it might be the most famous British show of all time. For all its fame, however, in many respects the premise of The Avengers is very simple. When the show began in 1962 it centred on Dr. David Keel (Ian Hendry), a surgeon who takes to fighting crime following the murder of his fiancée. Dr. Keel's partner in fighting crime was a mysterious figure known as John Steed (Patrick Macnee), who apparently had ties to British Intelligence. While Ian Hendry would leave the show after its first series, the show's premise of a "top professional" and "talented amateur" fighting crime together would remain. Of course, from there on out John Steed's partners would be a succession of beautiful, intelligent, and independent women: Mrs. Cathy Gale (Honor Blackman), Mrs. Emma Peel (Dame Diana Rigg), and Miss Tara King (Linda Thorson). John Steed's female partners were women as never seen before on television, either in the United Kingdom or the United States. It was not enough that they were intelligent, independent, and competent, but they could easily defeat most men in combat. A popular show in its first series, The Avengers became a phenomenon all its own in Britain with its second series, when Cathy Gale became one of John Steed's partners. With its fourth series, the first to feature Emma Peel, the show finally came to the United States. The Avengers became even more successful in the United Kingdom and developed a cult following in the United States, where it was even nominated for Emmy Awards. Despite its relatively simple premise (a professional spy teamed with an amateur crime fighter), The Avengers was unlike any show that had ever aired before, even beyond Steed's liberated female partners. At least from the second series onwards, John Steed and his partner of the moment fought a number of bizarre opponents and over time the tone of the series became very tongue in cheek. In the second and third series John Steed and Mrs. Gale faced such diabolical masterminds as a group plotting to re-enact the Gunpowder Plot with nuclear weapons and a conspiracy to restore the Stuarts to the throne of the United Kingdom. With the arrival of Emma Peel, the plots became even more outré, as Steed and Mrs. Peel faced remote controlled robots ("The Cybernauts") and even a sentient, man-eating plant from outer space ("Man-Eater of Surrey Green"). 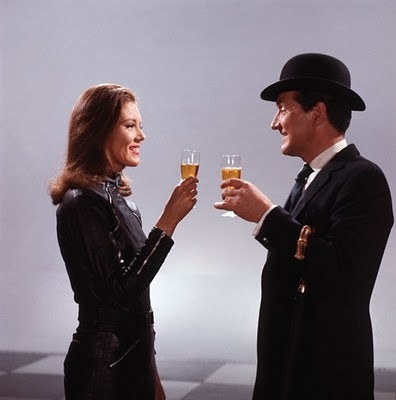 Among the strangest episodes of the entire run of The Avengers was "A Touch of Brimstone", in which John Steed and Emma Peel face a modern day version of the Hellfire Club. "A Touch of Brimstone" would also prove to be perhaps the most controversial episode of The Avengers, as well as one of the most popular. "A Touch of Brimstone" begins innocently enough, with the British government suffering embarrassment as a number of juvenile pranks are played on important, international figures: an exploding cigar, a collapsing seat in a theatre's box, and so on. John Steed determines that the Honourable John Cleverly Cartney (Peter Wyngarde) may be linked to the various pranks, as he is always present before, during, or after they occur. Of course, as might be expected, the pranks soon turn to murder, and Steed and Mrs. Peel find themselves facing Mr. Cartney and his modern day recreation of the notorious Hellfire Club. Naturally, this modern day Hellfire Club has much more sinister plans afoot than simple pranks or even murder. Today "A Touch of Brimstone" may be best remembered for its climax, in which Emma Peel is named "the Queen of Sin" by the Hellfire Club and clad in a spiked collar, a black Edwardian corset, and stiletto heeled boots. For those unfamiliar with the historical Hellfire Club, there were actually a number of exclusive clubs that went by that name in 18th Century Britain and Ireland. The best known of these clubs, and the one that Mr. Cartney obviously wants to emulate, was founded by Sir Francis Dashwood and John Montagu, 4th Earl of Sandwich, who met as part of a Hellfire Club in the 1730's at the the George and Vulture Inn before founding the Order of the Knights of St Francis in 1746. The Order of the Knights of St Francis, later given the name "the Hellfire Club", was devoted not only to parodying Christianity, but to drunken orgies and debauchery as well. Some very powerful men belonged to Sir Francis Dashwood's Hellfire Club, including John Montagu, 4th Earl of Sandwich; Thomas Potter (MP for Aylesbury, Okehampton and St Germans in Cornwall), jurist Robert Vansittart; and satirist Paul Whitehead. In addition to founding the best known Hellfire Club, Sir Francis Dashwood was also well known for his pranks, including the publication of an abridged version of the Church of England's Book of Common Prayer. As might be expected, recreating an 18th Century gentleman's club devoted to debauchery for a television show episode in the mid-Sixties would not meet with approval from all quarters. Rediffusion London, the ITV contractor who transmitted The Avengers in the London area, demanded cuts to "A Touch of Brimstone", particularly the climactic scene in which Cartney menaces Emma Peel with a whip. Associated British Corporation, who produced The Avengers, had no real objections to the episode. Ultimately Associated British Corporation cut the scene in which Cartney threatens Emma Peel from twelve cracks of the whip to only two, but absolutely refused to make any other cuts. The fact that "A Touch of Brimstone" was cut by censors was acknowledged by the British press at the time. The February 18 1966 issue of the Evening Standard even devoted an article to the episode with the headline, "What You Won’t See on The Avengers Tonight". Between Emma Peel's costume as the "Queen of Sin" and the scene in which Cartney threatens her with a whip, "A Touch of Brimstone" would cause even more of a furore at the American Broadcasting Company (ABC) in the United States than it had in Britain. American broadcasters being much more conservative than British broadcasters at the time, ABC found the episode wholly objectionable and simply refused to air it. Of course, here it must be noted that ABC was committed to only airing 21 of the 26 episodes produced for the fourth series of The Avengers. As to how they decided which five episodes of The Avengers not to air, it seems possible that it was based on any the content of the episodes (namely, was it objectionable or not). It seems notable that "Silent Dust", another one of the episodes not aired by ABC in the Untied States, contained a scene in which Emma Peel is threatened by a whip much like "A Touch of Brimstone". As to the other episodes not aired by ABC in the United States, "Honey for the Prince" featured Emma Peel in a harem outfit, and "Quick-Quick Slow Death” included a scene with a shoe salesman who is obviously a foot fetishist. Only “A Surfeit of H2O” contained little in the way of content ABC might have found offensive, unless one counts a villager building his own ark in anticipation of a second Great Flood. For all the controversy the scene in which Cartney menaces Emma Peel with a whip caused on both sides of the Pond, it is worth noting that the whip never touches Mrs. Peel. It is also worth nothing that "A Touch of Brimstone", nor any of the other episodes not aired by ABC, was not banned in the United States. When The Avengers entered syndication in the United States in 1969, it was included as part of the syndication package. The sequences in which Emma Peel is threatened with a whip would later be fully restored when The Avengers aired on the cable channel A&E in the Nineties and released on DVD. Of course, the scene in which Cartney threatens Emma with a whip was not the only sources of controversy with regards to "A Touch of Brimstone". According to the book The Complete Avengers: The Full Story of Britain's Smash Crime-Fighting Team by Dave Rogers, not only Rediffusion, but even studio technicians were worried about Emma Peel's costume as the "Queen of Sin". Curiously the "Queen of Sin" costume was designed by none other than Dame Diana Rigg herself. Despite the controversy that has surrounded "A Touch of Brimstone" to this day, it remains one of the best loved episodes of The Avengers among its fans. There can be no doubt that this is not due simply to Emma Peel's appearance as "the Queen of Sin" or the episode's idea of a modern day Hellfire Club. Instead "A Touch of Brimstone" remains popular because it is simply a well done episode. Not surprisingly, the episode was written by Brian Clemens, the man who largely shaped The Avengers into the show we now know. It was directed by Sidney Hill, who also directed the feature films A Study in Terror and Born Free as well as episodes of The Human Jungle, Gideon's Way, and The Saint. He also directed several other episodes of The Avengers. "A Touch of Brimstone" also featured a top notch cast. Peter Wyngarde played the role of the Honourable John Cleverly Cartney, a role that has since become possibly his best known aside from Jason King from the TV shows Department S and Jason King. Collin Jeavons, who appeared in several adaptations of Dickens novels and later had regular roles in such shows as Billy Liar and The Return of Sherlock Holmes, played Cartney's stooge Lord Darcy. Carol Cleveland, later best known for her work with Monty Python, played Cartney's somewhat scatter brained lover Sara. Robert Cawdron, who had a regular role on Dixon of Dock Green, played Horace, Lord Darcy's housekeeper and a member of the Hellfire Club. With top notch performances and top notch writing, it is little wonder that "A Touch of Brimstone" remains one of the most popular episodes of The Avengers. Indeed, in some respects it can be argued that "A Touch of Brimstone" is the quintessential episode of The Avengers. It features what might have been the most common premise for an episode during the show's run--John Steed and his partner of the moment fighting a bizarre conspiracy intent on toppling the British government. It also featured, for lack of a better term, the prerequisite kinkiness associated with the show. In fact, given Emma Peel's appearance as the Queen of Sin, it might well have more than its fair share of kinkiness. Finally, "A Touch of Brimstone" could well be the most "English" episode of what was a very English TV show. Let's face it, not only are Steed and Mrs. Peel battling a gentleman's club that takes its inspiration from Sir Francis Dashwood's original Hellfire Club, but we even get to see John Steed in a sword duel. Ultimately "A Touch of Brimstone" would have a lasting impact on both British and American pop culture. It is notable that, except for the 1961 film The Hellfire Club, the Hellfire Club was only rarely referenced in literature, films, or television prior to "A Touch of Brimstone". Since then it has been mentioned in several novels, as well as TV shows from Blackadder to Sleepy Hollow. The Hellfire Club in Marvel Comics' various "X-Men" series is obviously inspired by "A Touch of Brimstone". The Hellfire Club's Black Queen and White Queen obviously take their inspiration from Emma Peel as "the Queen of Sin". In the initial plotline featuring Marvel's Hellfire Club, the supervillain Mastermind even takes the identity of Jason Wyngarde, the name derived from Peter Wyngarde's surname and the first name of Mr. Wyngarde's most famous character (Jason King from Department S and Jason King). 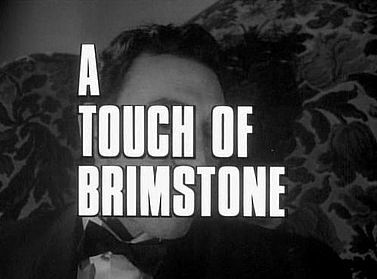 Given the controversy surrounding the episode, it should come as no surprise that "A Touch of Brimstone" was the highest rated episode during the first broadcast run of The Avengers in the United Kingdom. It was watched by 8.4 million viewers, a very substantial audience for a television show in Britain in the Sixties. To this day it remains the most famous (or perhaps notorious, if you prefer) episode of The Avengers of all time. It also remains one of the most popular of the show's episodes, if not its most popular. Given the talent that made the episode, as well as its resulting quality, this should come as no surprise. Emma Peel's appearance as "the Queen of Sin" might have made "A Touch of Brimstone" famous, but it is the episode's quality that has allowed it to maintain its popularity over the years. It's here! 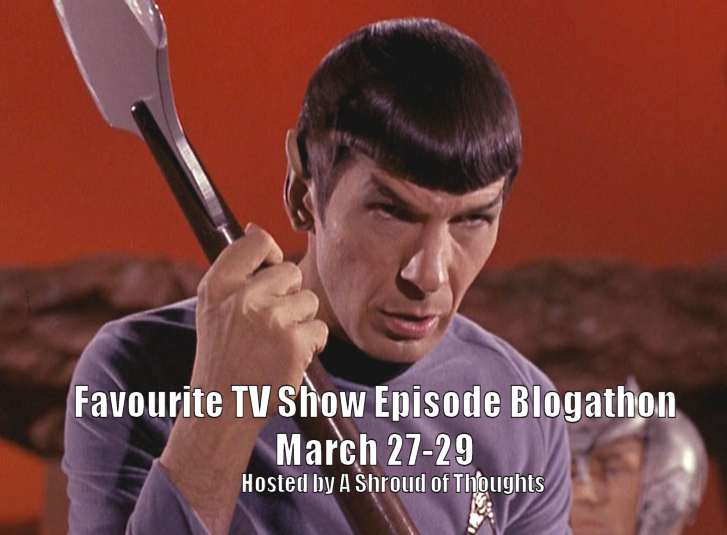 The Favourite TV Show Episode Blogathon has arrived. We have a very good line up for the blogathon, so much so that I have decided to make it an annual event. That having been said, next year I am paying more attention so it does not conflict with the Turner Classic Movies Classic Film Festival (which I hope I can attend). Barry Bradford Speaking for a Change: Quantum Leap "The Leap Home"
The Second Sentence: Favorite TV Episode Blogathon: The Virginian, "Siege"
The Hitless Wonder Blog: Favorite TV Show Episode Blogathon--"The Night the Wizard Shook the Earth"
KC's Film Forum: Flashback Friday: The Partridge Family, Season 1, Episode 8: "But the Memory Lingers On"
A Shroud of Thoughts: The Avengers "A Touch of Brimstone"
In The Good Old Days Of Classic Hollywood: The Barbara Stanwyck Show: "The Miraculous Journey of Tadpole Chan"
Girls Do Film: Twin Peaks (Episode 2): "Zen, or the skill to catch a killer"
Moon in Gemini: Fawlty Towers: "Gourmet Night"
Happy Turner Classic Movies Classic Film Festival 2015! 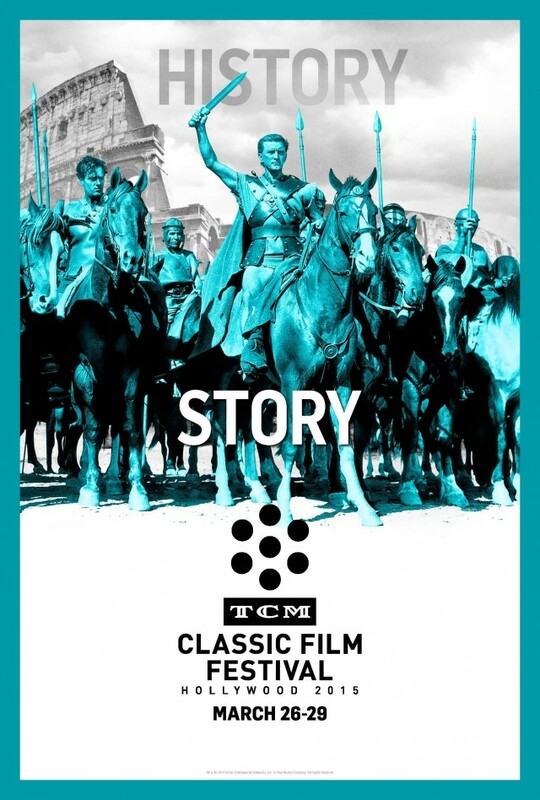 I just wanted to wish all my friends who are attending this year's Turner Classic Movies Classic Film Festival this year a good time and a great weekend! It was fifty years today that "Catch the Wind" by Donovan entered the British singles chart. It marked Donovan's debut on the chart, and "Catch the Wind" would be Donovan's first hit on both sides of the Pond. Ultimately "Catch the Wind" would go to #4 on the British singles chart. In the United States it peaked at #23 on the Billboard Hot 100. "Catch the Wind" would be the first of several hits that Donovan would have in both the United States and the United Kingdom in the late Sixties. Donovan would continue to hit the top forty on both sides of the Atlantic until 1969. It was that year that "Barabajagal (Love Is Hot)" became his last song to hit the top forty on either side of the Atlantic. Without further ado, here is "Catch the Wind" by Donovan. Ralph Taeger, who starred in the TV shows Klondike, Acapulco, and Hondo, died on March 11 2015 at the age of 78. Ralph Taeger was born on July 30 1936 in Richmond Hill, Queens, New York. For a brief time he played for the farm team for the Dodgers, but was sidelined by injuries to his knees. He chose acting as his new career and in the late Fifties enrolled in the American Academy of Dramatic Arts in New York City. Mr. Taeger was appearing in a play at the Beverly Hills Playhouse when he was signed to MGM. He made his film debut in an uncredited part in It Started with a Kiss in 1959. He made his television debut in an episode of Tombstone Territory in 1959. He guest starred in episodes of Lock Up, Men into Space, Bat Masterson, and Sea Hunt. It was in 1960 that he was cast opposite James Coburn in the short lived adventure series Klondike. After Klondike ended its run he played the lead in the short lived series Acapulco. In the Sixties he was the star of the short lived Western TV show Hondo (based on the John Wayne movie of the same name). He guest starred on such shows as The New Breed, Dobie Gillis, The Twilight Zone, and The Man From U.N.C.L.E. He appeared in the films X-15 (1961), The Carpetbaggers (1964), Stage to Thunder Rock (1964), A House Is Not a Home (1964), and The Delta Factor (1970). His career slowed in the Seventies. He guest stared in episodes of The Six Million Dollar Man and Quincy M.E. In the Eighties he made his last appearance on screen in an episode of Father Murphy. After his acting career he ran He operated Taeger's Firewood Company in Placerville, California. Those of you who visit the BBC News website on a regular basis may have noticed that today the website looks totally different. The reason for the redesign is that the old BBC News Website was nearly four years old and designed primarily for desktop and laptop PCs. According to Robin Pembrooke, the BBC's head of product for the BBC News and Weather sites, 65% of all visitors to the site now access it through mobile devices or tablets. BBC News then saw the need for a new site that adjusts its layout according to whether the visitor is using a PC, a mobile phone, or a tablet. According to a BBC News story on the change to the website, "Initial reactions to the new design were mixed." I think that might be putting it much too mildly given comments on a blog post about the change, which seem to me to be largely negative. The most common complaint appears to be that the new web site is simply too bright and there is too much white space. Other complaints have ranged from the site's typography to simply that it is unattractive. 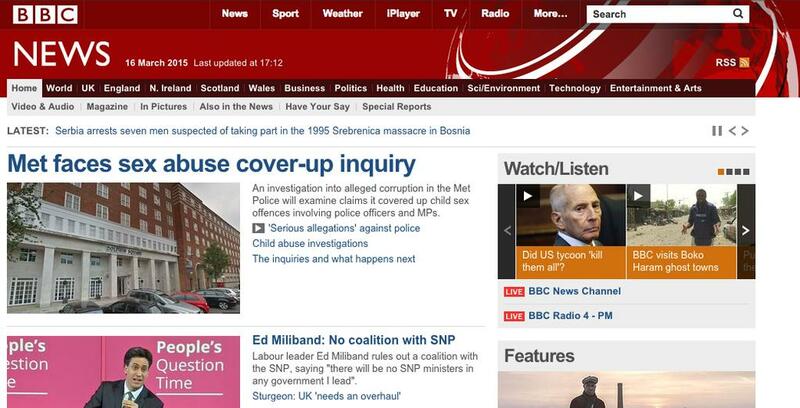 Personally, I think the new BBC News website is pretty. Despite having eyes that are very sensitive to light, I really don't find the vast amount of white space that annoying. That having been said, that is not to say that I do not feel the new BBC News website is vastly inferior to the old one. Quite simply, the new website is much harder to navigate. The biggest problem I have with the site's navigation is with regards to the various regions of the various countries that comprise the United Kingdom. For example, on the old site the BBC News England page had a box that included a map of England (as well as the Crown dependency of the Isle of Man and the Crown possessions of Jersey and Guernsey) along side a list of the various regions and cities in those regions. Under each city were a list of news stories associated with that area. It was then very easy to find news from the various regions of England. Unfortunately, on the new website there seems to be no logical listing of the various regions. As a result one must click upon the "Regions" tab at the top, then click on each region one by one to see news from that region. As might be expected, this is much more time consuming. Indeed, I think it would be regardless of whether one is using a PC, tablet, or mobile phone. In the end I think BBC News might see visitors to the site become increasingly frustrated with having to click link after link to get where they are going. And, unfortunately, many of those users might stop using the BBC News website as a result. Another complaint I have, and one that has been expressed by many other visitors to the BBC News website, is that the web pages on the new BBC News website seem to have less content than the ones on the old site. Indeed, the old website had sidebars on the right that were filled with various news stories. On the new website there is only a sidebar for videos and audios under the heading "Watch/Listen" and another sidebar with the heading "Most Popular" which features a rather meagre listing of headlines. From the various comments about the new website, it seems that many visited the BBC News website because they could get more news on one page than many other news sites. For people like that (including myself), the new website is a real step backwards. Now it is true that any time there are changes to a website there will be those who are very vocal in their criticisms. And often it is simply a minority who dislikes the changes to the website. In the case of BBC News, however, it seems to me that not only has reaction to the new site been overwhelmingly negative, but it seems to me that many of the criticisms are quite valid. In other words, these are not people complaining simply because they hate change, but because something they had found useful has become less so. A site they once found easy to navigate has now become much more difficult. In the end I think the new BBC News website will really need to be changed dramatically before most of its users are happy with it. While I really had no objection to it, given the number of complaints about "white space" they might want to rethink the site's colour scheme and layout. Given the complaints about the site's font, they might want to change that as well. Most importantly, at least from my perspective, they need to make the navigation easier to use. I honestly think the box containing the various regions that appeared on BBC News England, BBC News Northern Ireland, BBC News Scotland, and BBC News Wales was a great idea, and one that they should have kept. And I rather suspect if they want to keep visitors to the site, then they should probably bring it back. A news site does little good if the news is difficult to find on it.